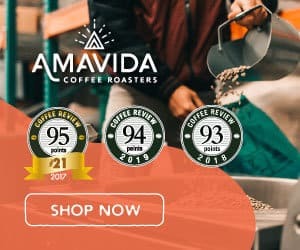 This coffee tied for the third-highest rating in a tasting of holiday coffees for Coffee Review‘s December 2018 tasting report. Produced from trees of the rare Ethiopia-derived botanical variety Gesha (also spelled Geisha) by Pablo Guerrero. With its generally elongated beans and distinctive floral and crisp, often chocolaty cup, the Gesha variety continues to distinguish itself as one of the world’s most unique coffees. This is a dry-processed or “natural” version, meaning the beans were dried inside the fruit rather than after the fruit has been removed, as is the case with wet-processed or “washed” coffees. The majority of Gesha coffees are grown in the Boquete region of Panama, but there is increased experimentation with this variety throughout Latin America, especially Colombia, where this exceptional version was grown. Joe Van Gogh is a small-batch roasting company with a focus on certified organic coffees. 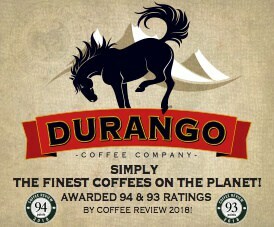 In addition to its Internet store, it operates six coffeehouses in Durham, Chapel Hill and Greensboro, North Carolina. Visit www.joevangogh.com or call 919-644-0111 for more information. The Bottom Line: Layers upon layers of spicy floral and fruit notes resonate in this natural-processed Gesha from Colombia.